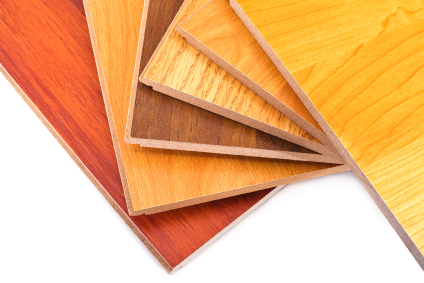 Laminate flooring's popularity has grown proportionally to its improvements. Features giving laminate flooring the look, feel, and sound of natural hardwood have changed this product drastically. Laminate flooring is composed of a high-density fiberboard core and a photographic image of a hardwood species on top. The material is then coated with melamine or resin-based cellulose. Texture may even be added to give laminate the feel of hardwood. In general, laminate flooring is durable, scratch resistant, fade resistant, and easy to maintain. Laminate is now an alternative to natural hardwood floors, and some brands price laminate flooring a dollar less per square foot than standard hardwood species. As floating floors, laminate is easy to install and requires no gluing or nailing. Even with significant improvements over the years, laminate flooring has a few downsides for those looking for the look and feel of genuine hardwood. Because of the photographic image on top, laminate cannot be refinished and often has a hollow sound. Adding underlayment can improve the latter. The photographic image of hardwood, additionally, is repetitive and does not have the natural and varying appearance of heartwood and sapwood. If making your laminate floors sound less hollow is a particular concern, underlayment will be part of installation. Prices for laminate flooring, then, need to include underlayment materials, the time spent installing them, and any trim moldings added. Even with its upsides and downsides, laminate flooring is still installed like most types of hardwoods. As you shop for laminate floors, take into account the cost of installation when fully pricing the product. Installing floating floors, for instance, costs $2.50 to $3.50 per square foot. Although sanding, coating, staining, or adding a moisture barrier are not necessary, floor preparation – priced at $60 per hour – may be needed. In this case, the repair time and materials needed to remove carpet or older flooring and dispose of them need to be factored into all laminate floor prices.